Once the thing of science fiction and anime, more companies and individuals are now working on their interpretations of giant robots. The latest, and possibly the most impressive, of these comes from Japanese engineer Masaaki Nagumo, who has created a massive, moving machine. Reuters reports that Nagumo’s favorite show growing up was the Mobile Suit Gundam TV series that started in 1979. 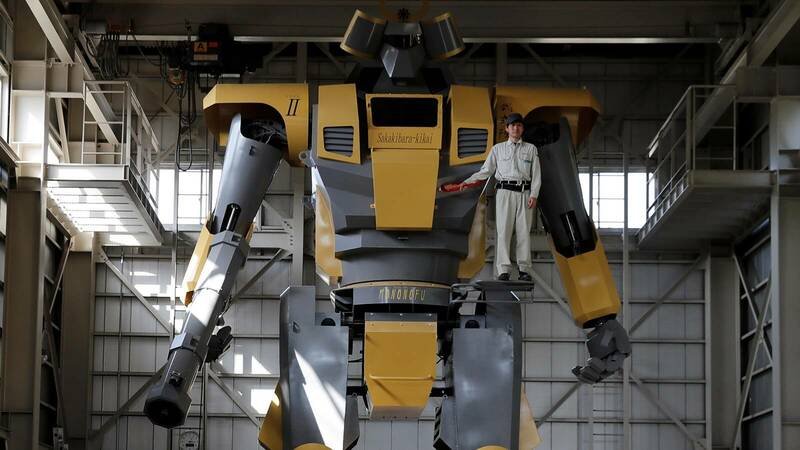 He drew inspiration from the anime when creating LW-Mononofu, which stands 28-feet tall and weighs over 7 tonnes. It was developed at Sakakibara Kikai. While primarily a maker of farm machinery, the company has also been creating giant robots for over a decade. Sakakibara Kikai rents out its other robots, including its ED-209-style Land Walker, smaller Kid’s Walker Cyclops, and the MechBoxer boxing machine for about 100,000 yen ($930) per hour to children’s parties and other entertainment events. While Mononofu can walk forward and backward, its speed is limited to around 0.6 miles per hour, though it does pack an impressive air gun on its right arm that fires sponge balls at 87 miles per hour. The robot can also move its fingers and twist its upper body, but one problem it faces is that it’s too big to go through the factory’s entrance and must be dismantled in order to exit. Back in January, a company called Furrion released a video showing its 15-foot tall, 8000-pound Prosthesis robot moving around. It hopes to start a racing league with other robots at some point in the future. Following its victory over Japan last year, Megabots, the team behind the American half of the giant robot battle, launched a Kickstarter campaign to fund a full tournament. Sadly, it was quickly canceled after the organizers realized it was never going to reach its target.